Mandela was part of a large number of African militants (some of whom preceded him), who in face of the inhumane and unjust reality of apartheid, decided to take the bull by the horns and unleashed a long struggle. It lasted close to a century - from the time the ANC was created to the time the apartheid system was officially brought down - in a process that culminated with the first multi-racial election in 1994. During that extended period, thousands of people gave their lives in an epic struggle. It eventually spilled over the borders of South Africa, with tragic consequences for what was known as the frontline states - countries such as Mozambique, Angola, Namibia, Zambia and Zimbabwe. Only few historical figures such as Nelson Mandela, Steven Biko (the leader and theoretician of the Black Consciousness Movement or Winnie Mandela (the former wife of Nelson Mandela) are known to the larger public. However, hundreds of thousands of people died to bring down the apartheid system. In fact the TRC (Truth and Reconciliation Committee) that Mandela established after becoming president to avoid bloodshed in the country, noted in one of its reports, that “there were more victims of the apartheid system in the surrounding countries than inside south Africa”. The decisive defeat in Angola of the racist’s armed forces of the apartheid South African state by combined Angolan and Cuban troops marked a landmark in the struggle for African independence and self-determination. That defeat led to immediate independence for Namibia and subsequently accelerated the end of racist rule in South Africa. While the mainstream media try to focus on the surface, the person of Nelson, who of course has been a great African leader alongside other revolutionaries and African nationalists such as Kwame Nkrumah, Eduardo Mondlane, Amilcar Cabral, Samora Machel and many others, it is important to locate Mandela’s rise as a strong African leader within a larger context. Those conditions breed resistance and bring people to the point of taking action and organizing to defeat the system that maintains them under subjugation and oppression. As leaders around the world pay tribute to his legacy, the African masses have to learn from the historical path undertaken by Mandela during his long march to freedom. The path leads from the inception of Umkhunto Wi sizwe, the military branch of the ANC which was absolutely necessary under the conditions under which it was created, to the Soweto uprisings in 1976 that marked a qualitatively higher level of mobilization of African masses against apartheid, and on to the official end of apartheid in 1994. During each of those periods, Mandela fought alongside his comrades in the ANC, the SACP (South African Communist Party) the civil society organizations such as the labor movement COSATU (Confederation of South African Trade Unions) –UDF (United Democratic Front), but also internationally with the active solidarity of other national liberation movements such as the MPLA in Angola, FRELIMO in Mozambique, SWAPO in Namibia. All those dynamics made possible the openings we witnessed that culminated in the 1994 election that saw the election of the first Black president is SA. ?The unresolved question of the access to land, which should be one of the most burning issues that needs to be tackled. This is even more critical as we witness across the continent a vast land grab that threatens to roll back the few gains that were made possible by the national liberation movements of which Mandela was a product.
? The pattern of ownership of the resources in the country... mainly the mining resources that are still controlled by the economic forces that were at play during the apartheid era and that are still operating today.
? The lack of economic opportunity for a younger generation of South Africans, many of whom do not even realize today the sacrifices that people like Mandela and others had to make to create conditions for them to be able to move around freely across the country today. This young generation, which represents the majority of South Africans, might not have the patience, nor the wisdom of people like Mandela if their living conditions stay as they are today... I mean no future but a life of desperation and hopelessness. It would not take time for them to realize that the creation of a tiny Black bourgeoisie has never been able to alleviate the suffering of the vast majority of the people. Today we are at a crossroads, across the continent, where African youths are showing signs of impatience and desperation in some situations. In the present context, it is up to the progressive forces favorable to radical changes within our societies to reconnect with the tradition of organizing and struggle by combining forces and by clearly stating through a clear vision where they would like to take Africa in the decades to come. Only when we embark on that path will be able to say that the struggle waged by Mandela was not in vain and that a new generation is rising ready to use all means necessary to regain control over their destiny after centuries marked by tremendous suffering from slavery to apartheid by way of colonization. To comrade Madiba and those who gave their lives for this noble struggle, we raise our fists and send them our last salute, may their souls rest in eternal peace and may those who survive them be guided by the principles of MAAT transmitted to us from ancient Egypt, generation after generation, making us strong enough to still be here in this world where in fact we were supposed to be wiped out long ago. 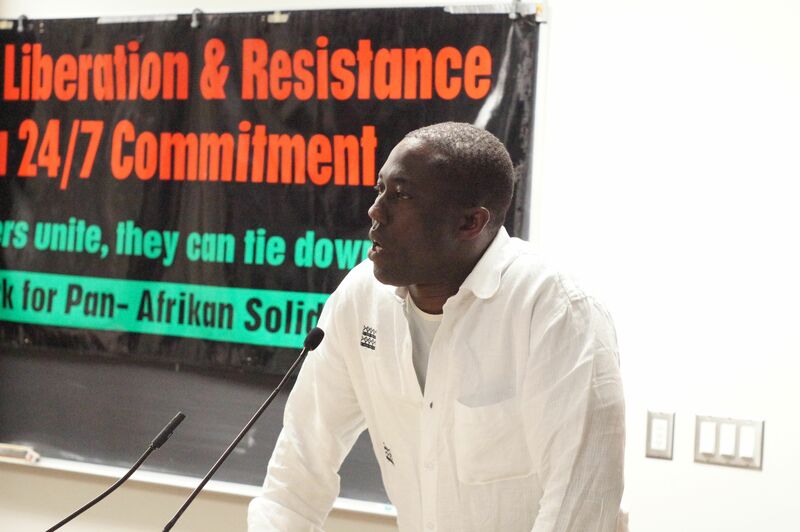 A Luta continua – The struggle continues for a free and independent Africa... AMANDLA!!!! !